The summer spent by the artist in the Tver region, in Ostrovno, was filled with delightful emotions from enjoying the beauty of nature. Here one could indulge in philosophical reflections, solving the secrets of life. By conviction, life after death was like a deep pool. Due to serious heart problems, he was often haunted by such thoughts. 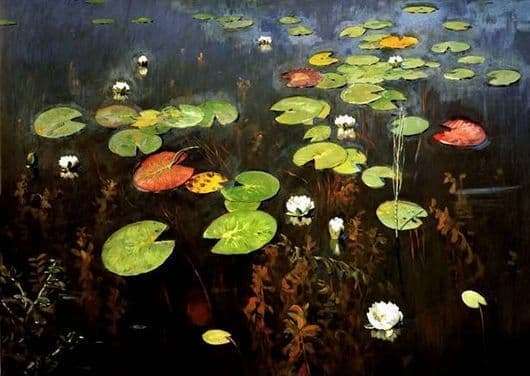 On this canvas, Levitan sought to create water lilies apart from the general background of the image. And he succeeded brilliantly. He wrote them standing in his boat, and his oars luly paddled his oars. In the picture, the horizon is located somewhere behind its redistribution, which creates the effect of highlighting the surface of the water with non-leaf leaves and flowers lying on it. According to a local legend, next to Ostrovno there was an enchanted lake, completely covered with leaves and flowers of lilies. In the people they were considered a symbol of the fight against evil forces, as well as assistants to travelers who were going to go a long way. On this lake, the artist apparently found the answers to his questions. Here he draws a line between two worlds. He saw the secret life in the depths of the lake, and white lilies were floating above the dark pool. The artist displayed the existence of the underworld through the image of a plexus of plant stems germinating from the underwater depth to the surface itself.